Dubai: When Abdullah Humaid Al Muhairi prepared to perform his final routine in the H.H. Sharjah Ruler Cup International Show Jumping Championship (CSI5*W) aboard his horse Cha Cha Cha, you could almost hear a pin drop in the indoor arena. The tension was palpable and the audience held their collective breath as Al Muhairi and Cha Cha Cha sailed over one fence after the other with sheer perfection. Then as the pair comfortably cleared the final obstacle a roar of approval and joy rent through the air at the Sharjah Equestrian Club. Then as the giant television screen flashed the recorded timing, 43.12 seconds, the screams and cheers grew even louder. It was the faster time of the day, eclipsing a star cast of 42 horse and rider combinations from around the world competing in the FEI Jumping World Cup counting for the Arab League. Nobody would better Al Muhairi’s performance and he would be crowned champion and with it book his ticket to the Gothenburg Horse Show for the FEI World Cup finals from April 3-7. But Al Muhairi was looking beyond the prestigious Swedish Championship as he revealed: “My goal has always been to compete at the Olympic Games (Tokyo, 2020),” he said. “That was the dream and it is now alive. “It is a long hard road and I will need to up my game further and put in the extra hours. But I’m prepared to do whatever it takes to represent the UAE, and hopefully win a medal. The road to Tokyo begins with the Gothenburg World Cup, but Al Muhairi has additional concerns ahead for the qualifiers. “I promise that if I find the right horse I will deliver a good result. Only Swedish rider Evelina Tovek (43.78 seconds) and Switzerland’s Janika Sprunger (43.79), winner at Emirates Airline Dubai Grand Prix at the Dubai Show Jumping Championships earlier this month, could come close. Abdullah Mohammad Al Marri from the UAE, aboard James V.D Oude Heihoef, finished a creditable fourth in 44.80 seconds. John Roche, the FEI director of jumping, believes that Al Muhairi and the rest of the UAE team are ‘knocking at the door’. “The level of riding has improved in leaps and bounds and the quality of jumping here is absolutely world class,” he said. “It’s fantastic that the sport has developed and progressed so much in the entire region. Sultan Mohammad Khalifa Al Yahyai, general manager of the Sharjah Equestrian and Racing Club, has been a passionate promoter of the sport and was also in no doubt that the UAE would make their mark at the highest levels in the sport. The H.H. 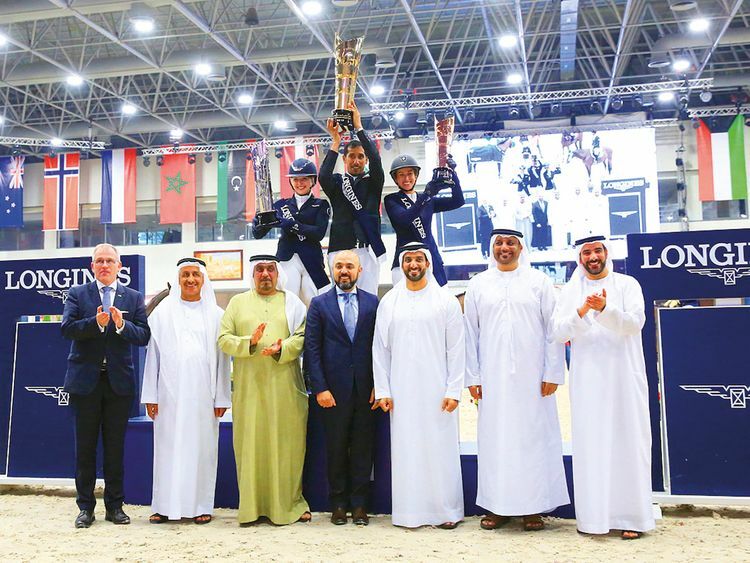 Sharjah Ruler Cup was held in cooperation with the UAE Equestrian and Racing Federation (UAEERF) and under the supervision of the International Equestrian Federation (FEI).